Flipkart has kicked off a new Mobiles Bonanza sales during which the e-commerce giant is offering attractive discounts on various smartphones. The sale starts today and will conclude on March 15, with a ton of different offers when it comes to flagship smartphones like the newly launched Galaxy S9 and the Galaxy S9+ as well as previous generation flagships on offer, however, one of the best deals you can score on a smartphone during the sales fest is available on the Google Pixel 2 XL. 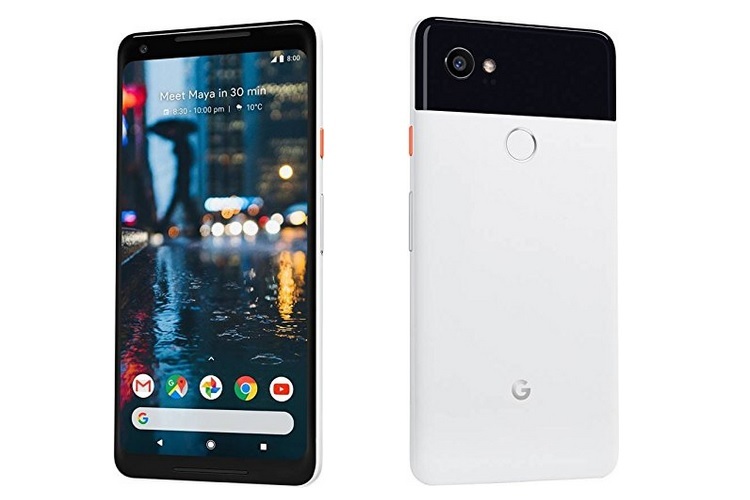 The 64GB variant of the Google Pixel 2 XL that usually goes for Rs. 73,000 is now available for just Rs. 54,999, which amounts to a hefty discount of 24% on its normal price. As part of the Mobiles Bonanza offer, Flipkart is also offering a lucrative exchange offer, so if you have an old smartphone, you can exchange it and avail a hefty discount of up to Rs. 18,000 on the Pixel 2 XL, bringing its effective price down to just Rs. 36,999. Flipkart will also offer a straight 5% discount on a purchase made using an Axis Bank Buzz Credit Card. Moreover, you can avail a cashback of Rs. 10,000 if you purchase the device using a CitiBank Card, further bringing down the Pixel 2 XL’s effective price point. Coming to the 128GB variant of the Google Pixel 2 XL, which usually cost Rs. 82,000, it is currently going for just Rs. 63,999. The CitiBank and Axis bank card offers are also applicable to this phone. And again, you can exchange your old smartphone to get up to Rs. 18,000 off and bring down its effective price to just Rs. Rs. 45,999. 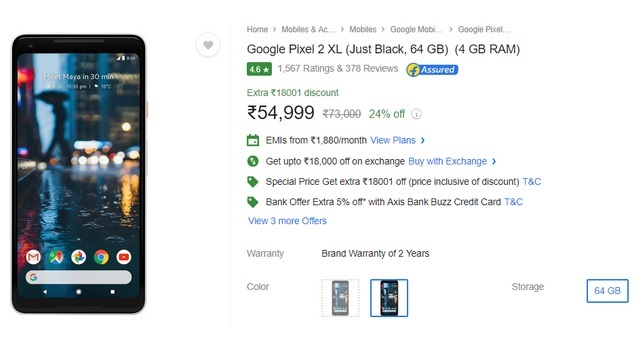 You can also check other attractive offers on the Pixel 2, which is also available at a hefty discount during Flipkart’s ongoing Mobiles Bonanza sales.